Emiko Terazono reported yesterday at The Financial Times Online that, “Global food prices fell to the lowest level in four years in 2014, as plentiful supplies of cereals, dairy products, sugar and vegetable oils pushed markets lower. 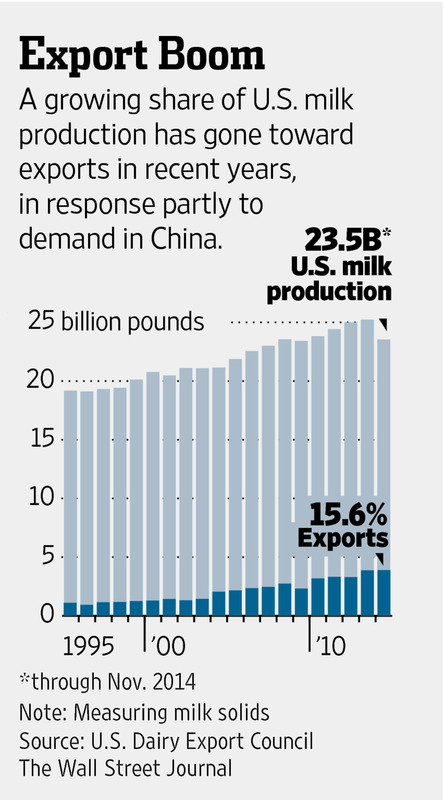 Ilan Brat and Kelsey Gee reported in today’s Wall Street Journal that, “Historically, America’s dairy processors have focused on their home markets, but many of them have retooled in the past decade, boosting output to help supply infant formula, cheese and other products to China and other countries with rapidly expanding middle classes. Since 2012, U.S. milk-powder production capacity has increased 25%, according to Tim Hunt, a global dairy strategist for the Dutch banking group Rabobank. The Journal writers explained that, “The export boom was driven by several factors, most importantly a 2008 scandal in China in which tainted milk killed six children and sickened about 300,000 others, destroying the faith of Chinese consumers in the nation’s dairy industry. Meanwhile, DTN writer Todd Neeley reported yesterday that, “A new strain of the porcine epidemic diarrhea virus, or PED, was recently identified in a Minnesota herd, but the news shouldn’t alarm pork producers, scientists told DTN. That’s because the new strain is nearly identical to the existing strain that caused the deaths of millions of piglets in the past 18 months. In policy news related to animal agriculture, Heather Haddon reported yesterday at The Wall Street Journal Online that, “[T]he Garden State has become a flash point in the battle between animal-advocacy groups looking to ban the use of the crates and industry groups defending their right to the practice. The Times article pointed out that, “A consumer, however, has almost no quick way of recognizing the varied criteria among a number of groups offering certification. The article noted that, “It is the coldest weather since the region was hit last year by a polar vortex, which is a mass of frigid air that typically only resides over the north pole. In other news, AP writer Darlene Superville reported yesterday that, “Michelle Obama’s anti-childhood obesity initiative is getting a new leader. AP writer Mary Clare Jalonick reported yesterday that, “For years, the government has told Americans to eat their vegetables. A rewrite of the government’s dietary guidelines could include some new advice, too, on sugar, salt, meat and caffeine. “Whether individuals listen or not, the dietary guidelines affect nutritional patterns throughout the country – from federally subsidized school lunches to labels on food packages to your doctor’s advice. They also form the basis for the government’s ‘My Plate’ icon, which replaced the food pyramid a few years ago. Meanwhile, McClatchy writer Lindsay Wise reported yesterday that, “Kansas Sen. Pat Roberts officially took the helm of the Senate’s agriculture committee Thursday, promising an ‘aggressive schedule’ of hearings focused on everything from farm programs and school meals to oversight of the Environmental Protection Agency. The article indicated that, “He’ll make history as the first member of Congress to head both the House of Representatives and Senate agriculture committees. Ashley Parker reported in today’s New York Times that, “House Republicans moved Thursday to create a bill that would fund most of the Department of Homeland Security while preventing President Obama from carrying out his recent executive action on immigration, in an effort to appease their more conservative members. “If that approach passes the House, however, it is unlikely to clear the Senate, where Republicans will need at least half a dozen Democratic votes to overcome a filibuster. And even if the Senate approves the measure, Mr. Obama has threatened to veto Republican legislation that would undo his immigration action. Funding for the department is set to run out at the end of February, something both parties hope to avoid. Ms. Parker explained that, “At the end of the last Congress, Representative Harold Rogers, Republican of Kentucky and chairman of the House Appropriations Committee, said that his committee did not have the authority to withhold money from Citizenship and Immigration Services, which is tasked with carrying out most of the president’s executive action, because the agency is funded by the fees it collects from immigration applications. Today’s article added that, “Another proposal, spearheaded by Representative Robert B. Aderholt, Republican of Alabama and a member of the Appropriations Committee, would nullify Mr. Obama’s executive action on immigration from last year and prevent him from taking any new unilateral steps. Senator Jeff Sessions, Republican of Alabama and an outspoken opponent of an immigration overhaul, has signaled that he supports Mr. Aderholt’s legislation, and Senator Ron Johnson, Republican of Wisconsin and chairman of the Homeland Security and Governmental Affairs Committee, is offering similar legislation in the Senate. A news release yesterday from Rep. Steve King (R., Iowa) noted in part that, “[Rep. King] released the following statement after introducing his Defund Executive Amnesty Act. This bill will defund all executive amnesty created by our current, lawless administration. An editorial yesterday at The Financial Times Online stated that, “A year ago President Barack Obama called on the US Congress to give him fast track authority to negotiate big trade deals in the Pacific and Atlantic. Harry Reid, then Senate majority leader, scuttled Mr Obama’s request saying it would be unwise to agree to it in an election year. Mr Reid’s caution was scant help to his fellow Democrats who went on to lose the Senate in last November’s midterm elections. Vicki Needham reported yesterday at The Hill Online that, “House Minority Leader Nancy Pelosi (Calif.) on Thursday said Democrats aren’t opposed to trade, but want to make sure any deals negotiated by the administration help U.S. workers. And, Julie Hirschfeld Davis reported in today’s New York Times that, “President Obama is facing opposition from fellow Democrats to one of his top priorities: winning the power to negotiate international trade agreements and speed them through Congress. “As Mr. Obama’s team works privately to line up support for the so-called trade promotion authority, a coalition of Democratic lawmakers and activists from organized labor, environmental, religious and civil rights groups is stepping up efforts to stop him. Reuters writer Krista Hughes reported yesterday that, “Unions, progressive lawmakers, consumer advocates, environmentalists, and social justice and human rights lobbyists kicked off a campaign on Thursday to oppose fast-track, which would allow Congress a yes-or-no vote on trade deals in exchange for setting negotiating goals. “‘This coalition exists because trade deals affect everybody,’ Representative Rosa DeLauro, a Democrat of Connecticut, told a news conference, as she predicted defeat for fast-track legislation, which is expected to be introduced early this year. Meanwhile, Mitsuru Obe reported yesterday at The Wall Street Journal Online that, “An upcoming governor’s race in a rural prefecture in southern Japan will be the first real test of whether Prime Minister Shinzo Abe has gained enough clout from his party’s landslide electoral win to take on a powerful interest group representing the nation’s small farmers. “The poll that will be held in Saga prefecture on Sunday pits a candidate handpicked by the premier against a candidate backed by the Japanese Agricultural Co-operatives, which is better known as JA. Mr. Abe has made agriculture a key part of his pro-growth policies and JA, which has a decisive say over how farmers do business in Japan, stands in the way of that. Also yesterday, DTN Ag Policy Editor Chris Clayton reported that, “Agricultural groups are lining up in droves to support President Barack Obama’s efforts to normalize trade relations with Cuba even as longtime critics in Congress pan the proposal. “The U.S. Agriculture Coalition for Cuba formally rolled out its public launch Thursday in Washington with more than 30 major agricultural groups and businesses joining forces. The coalition’s goal is to end the 54-year-old embargo and open trade with the island. The Washington Post editorial board indicated today that, “In announcing the normalization of relations with Cuba last month, President Obama violated two pledges he had made: to link such a liberalization to ‘significant steps toward democracy,’ including the freeing of all political prisoners; and to consult with Cuban civil society, including pro-democracy activists, on the change. In what looked at the time like a partial recompense, the White House announced that the Castro regime had agreed to free 53 detainees — or about half the number of political prisoners identified by Cuban human rights activists.